The world is moving at lightning speed from legacy enterprise software to SOA, SaaS integration, and APIs, compelled by the power of convention over configuration and the promise of agility and operational efficiency. Yet most businesses face a widening divergence between the IT infrastructure demanded by emerging business needs and the infrastructure they’ve built up over generations. The result? Many organizations find it difficult to modernize their legacy systems in a way that enables them to create an IT strategy that supports the quick adoption of newer technologies such as cloud, big data, IoT, and mobile. This is where APIs come in. 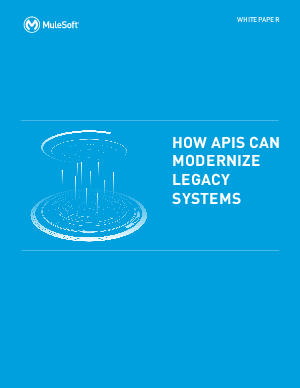 Don’t ditch your legacy systems, modernize them.